The Reims-Cessna F406 Caravan II is a twin-engined turboprop-powered max. 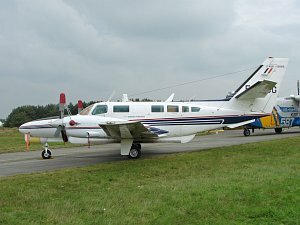 twelve-seat light utility and commuter aircraft produced by the French manufacturer Reims Aviation Industries, today GECI Aviation under cooperation with Cessna Aircraft Company. The F406 Caravan II is a development of the Cessna 404 Titan with components of the Cessna 425 and the wings of the Cessna 441. The normal seating is up to 9.